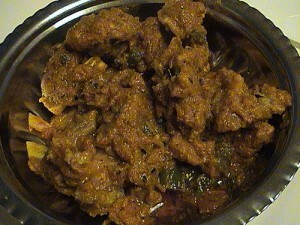 Achar Gosht recipe by Afshan Nasir Alam at DesiRecipes.com. Grind the onion and fry in hot oil with ginger garlic paste, after few minutes add red chillies, haldi and salt and fry. Now add mutton and cook with water till tender. Then add yogurt and fry well. Add soonf, dhania, kalongi, meethi, green chilly and put on dum for 5-10 minutes. In the preparation it suggests that "red cjhillies" are needed. No mention of them in the ingredients. This is inexcusable if the author has pride in the outcome. It's like leaving one of a few kids behind in Disney World and returning home. maybe try using english terms for spices like fennel, tumeric, coriander etc. will make these recipes more accessible to more people.